If you’ve spent any time in swimming, you’ve probably known a drop-dead sprinter or two. 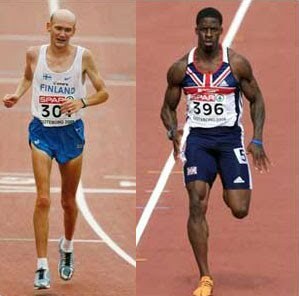 The issue is that drop-dead sprinters are not physically like the rest of us, and the difference occurs within the muscles. The average person typically has a little less than 50% fast-twitch and the rest slow-twitch muscle fibres. Fast-twitch fibres [FT] can contract in less than half the time of slow-twitch muscle fibres [ST], allowing for far more explosive strength. The problem is that this also means that athletes with a high FT percentage go through energy far faster than other athletes. Meanwhile ST contract slowly, require little energy, and drop-dead sprinters don’t have a lot of that. Not surprisingly, different sports attract athletes with extremes in FT. Elite running sprinters have up 85% FT, which makes sense as they have purely anaerobic races, while elite marathon runners typically have about 25% FT. Swimmers, with no purely anaerobic events and lots of very aerobic events, tend to have a range of FT from just over 50% to down to 33% according to one study. And this brings us back to swimming’s drop-dead sprinters. Their FT will probably be 60%-75% FT, meaning they can go fast, but don’t have a lot of ST to enable them to go slow. Basically, in a typical swim practice, they just run out of energy far before anybody else. Unfortunately, other swimmers and even coaches often view this behaviour as being lazy. 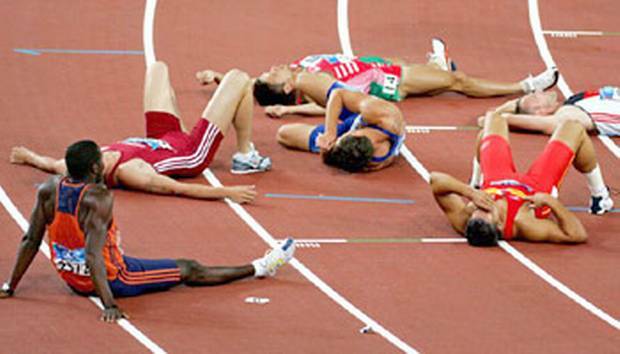 Drop-dead sprinters violate the principle inherent behind every practice. The only way to get fast is to train long and hard. A common refrain is, “Just imagine how good they’d be if they just trained hard!” And here’s the problem. 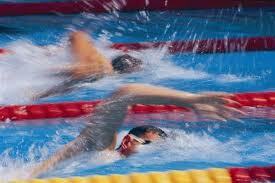 Most coaches try to train drop-dead sprinters as if they were normal swimmers. And the result is predictable: the swimmer quits either through injury or frustration, or the coach kicks them off the team. David Epstein discusses this concept in “The Sports Gene”. He talks about Jesper Andersen and his work researching the muscle fibre types of Danish professional soccer players. Andersen determined that the most of those tested had fewer fast-twitch fibres than an average person, despite speed being one of the most sought after qualities in the game. Further work lead him to discover the reason. At developmental levels, all players are trained exactly the same, and this lead to the FT players getting injured all the time from the workload. Injury-prone athletes just don’t make desirable professional soccer players. Andersen’s solution: don’t train all players the same. So what are the problems with adopting his solution, and train high-FT swimmers differently than the rest? Those are not trivial problems. What each coach has to face is whether those problems are worth the benefit of having a blazingly fast swimmer on the team. Previous Post Disqualifications: Fight Them or Accept Them? The philosophy of ‘speed through endurance’ is an example of how not to train by Exercise Physiologists. They use swimming coaches as examples of incorrect training. So many swimmers who are great swimmers quit because they are trained incorrectly. I agree Gary. I’ve seen it over and over with swim teams. One type of training for everybody. We even build in distance free and IM pre-requisite times in order to be allowed to go to Provincials here in Ontario. Imagine a drop-dead sprinter being told they have to beat fairly tough 800 Free and 400 IM times in addition to their blazing fast sprint times. That’s what we do here on an institutional level. I just remembered myself in our swimming team in late 1970’s. Despite very good results under 100m in all styles, I finally had to quit as the club “policies” required uniform approach to all swimmers. What was interesting… swimming theoretics in USSR (my native country) has paid much attention to difference between (in those days terms) “explosive strength” and “power endurance” as attributes of sprinters and stayers, respectively. But there was strong believe among coaches community that muscles could be trained either way, hence any “drop dead sprinter” could be re-trained in order to fit into adopted schedules. And if he/she was not able to adapt, – so bad for them. Great blog, by the way. Just discovered and added to my bookmarks.